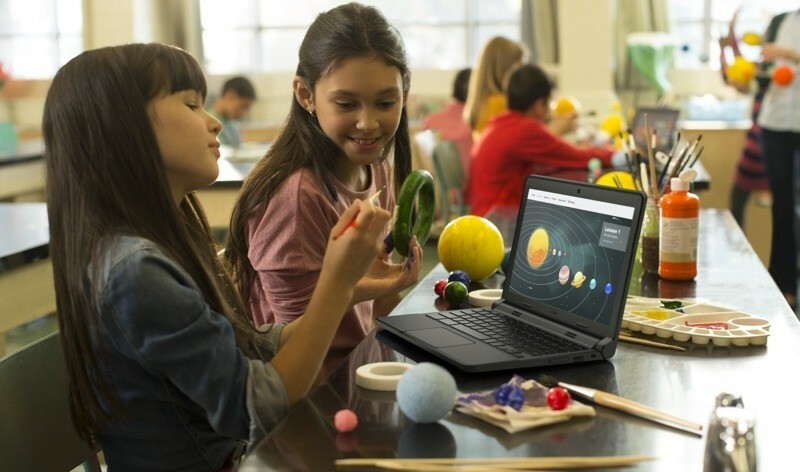 Dell has just announced a refreshed model of its education-focused Chromebook 11, featuring a more durable design and slightly upgraded hardware including a dual-core, Intel Bay Trail-M Celeron processor clocked at 2.16GHz alongside a 10-hour battery and a faster 802.11ac WiFi radio. The base model includes 2GB of memory and 16GB of flash storage, as well as a standard 1366 x 768 anti-glare display for $249. An extra $50 gets you double the RAM and a 4GB RAM model with a touchscreen will cost you $329. Dell says it has put a lot of focus on the durability of the Chromebook 11 to make it “backpack ready”. This includes a rubberized trim, MIL-STD 810G testing for pressure, temperature, shock, and vibration, and a 180-degree hinge that can stay in place even if held by the screen. The company also introduced a Windows version of the laptop, the Latitude 11 Education Series, as well as a new pair of Venue 10 tablets. The former is styled similar to the Chromebook 11 and is also powered by a Bay Trail-M CPU, but runs Windows 8.1 or 7, has an Ethernet jack, and ships with either a mechanical hard drive or SSD -- the Chromebook 11 sticks to low-cost eMMC. As for the tablets the Venue 10 will run Android 5.0 Lollipop and the Venue 10 Pro Windows 8.1. Dell didn’t provide a full spec list but both models are expected to feature 10.1-inch panels with a 1280 x 800 resolution. The Windows version starts at $330 and will be available next month, while its Android counterpart is slated for Spring and hasn’t been priced yet.